Episode 45 drops whilst the UK is covered in snow, which is fitting as the episode has a very Hoth feel. Richard has recently been to Finse, Norway for an event based on Hoth and hosted at the filming location, this month instead of a feature interview we hear all about the trip which includes interviews with others who attended the event or presented. Some great stories of the filming era which you may or may not know but definitely worth a listen. Stuart takes over hosting duties on Newest Acquisitions whilst Jez is at school. 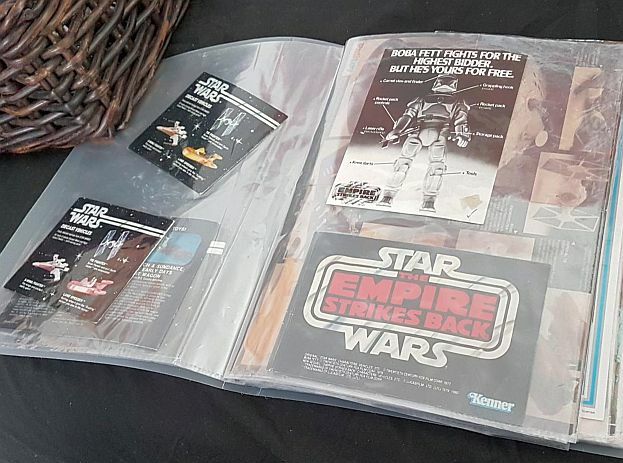 The team look at several items which include a Pre-production Diecast TIE-Fighter wing, a mint Return of the Jedi two pack, 12" Luke Skywalker Bespin transparency and a beaten up Luke Skywalker Model Trem. We hear from two collectors as they discuss their recent purchases, Dallas Ewen discusses his Grubee exclusive cups which were only available in food outlets around Winnipeg, Canada and Blake Bundy tells us about picking up his final 12 back to complete the run. Of course NA finishes with a look at one specific item, this month the lads look at the Hoth Ice Planet Adventure Set where the Vintage Alliance come up with more great information. In a new section, Peter looks at other non action figure related Hoth items that may tickle people's fancy. Along with the top 5, Simon attempts to dazzle us with his Gimcrack but can it beat Richard's controversial entry. Rich looks at a range of topics during Rebel Briefings, from the current collecting climate including asking whether POTF MOCs were sold in the UK and whether current eBay practices are ethical. This is balanced out with an update to Brian Angel's quest and some more news of great fundraising ventures. With Peter undergoing a new section, Simon jumps in to reinvent the Market segment, during this element Simon takes a look at the market place from eBay to auction houses, plus takes a look at current AT-AT prices, has this huge piece become the flavour of the month??? The podcast is filled with so much more, from the usual quiz to Richard trying to dig himself out of a Detolf hole, it's all here. Hey, even Jez drops by to give us a Running Stormtrooper update!!! Can’t wait to hear about the beast from the north east’s Hoth adventure! Downloading now! Enjoying so for guys, the quiz is even interesting this month! Downloaded ready for listening. Cant wait for monthly fix as going backwards through old podcasts getting aged at Ep 12! What is it going to be like though without the awesome Jez? I like Richards report on Finse venture and of course the Han Solo blaster sound effects! Listening now. Thanks for another great episode, lads. I'm currently loving the Norway interview with Rich - I love locations chat. 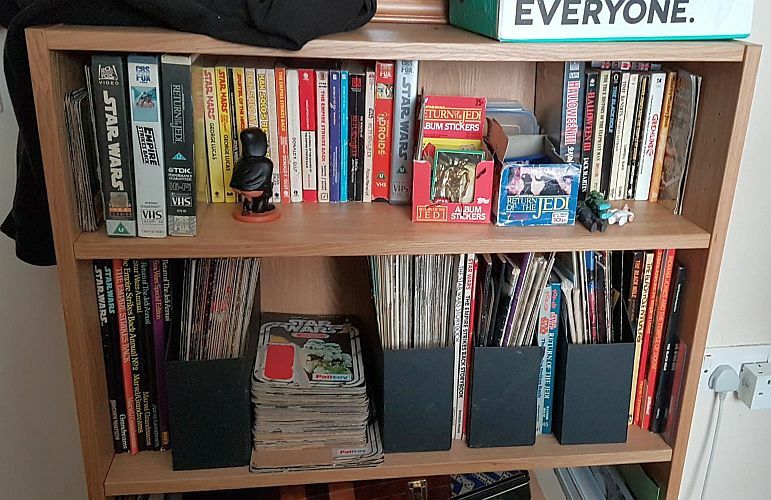 As for storing paperwork and mags, I just do so as i would circa 1983 but with slightly more care in the form of magazine files to hold the comics and poster-mags etc. My local pound-shop has provided a folder to keep the paperwork in. Also, I don't think that Kaye's Catalogue can be totally ruled out for selling POTF on the basis of their catalog pictures as these thing tended to have a photo of four random loose figures with a 'actual figures may vary' disclaimer. i agree that it's bloody unlikely though. And..that eBay ponce found a novel use for that loose Falcon shell. What a chancer. Detolf snob was being thought of initially but then a few started agreeing that perhaps detolfs were not a total solution as the collection goes on/ builds. I then thought what alternative display cupboards are available then espically if I want to display carded figures? All thought provoking so will wait a bit now on my own plans for buying a detolf to see how people display items for variety. Listening now! Quick question - during the POTF discussion somebody mentioned a Canadian POTF 2 pack with Han Carbonite in it? I can't find any info about that, links anyone? Sorry Edd no recollection of that. Will listen back to it soon. Detolfs for the 2-1b win. In yer face Rich!